Support Level Agreements that work with your business instead of against it, create a healthier bottom line, increase network uptime, and provide stability for your team. Understand how to evaluate your current coverage needs and take the first step to developing a support agreement that meets both your budgetary and network requirements. Are you ready to create a customized SLA for your business? 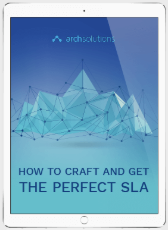 You will be after reading How to Craft the Perfect SLA.